FREE SHIPPING ON 2+ BOOKS! Homicide cop Eve Dallas and her billionaire husband, Roarke, are building a school and youth shelter. For expert help, they hire child psychologist Rochelle Pickering—whose brother Lyle pulled himself out of a spiral of addiction and crime. Lyle is thrilled about his sister’s job offer. But hours later, Rochelle finds Lyle dead with a syringe in his lap, and Eve’s investigation confirms that this wasn’t an OD. After all his work to get clean, Lyle’s been pumped full of poison—and a neighbor saw a scruffy, pink-haired girl flee the scene. 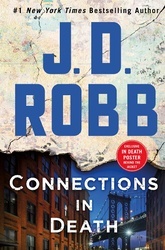 So Eve and Roarke venture into the ugly, underground world of tattoo parlors and strip joints. They believe in giving people a second chance, but whoever ordered Lyle’s murder has run out of chances. Copyright © 2017 Bookspan. Doubleday Book Club ® is a registered trademark of Random House. Used under license. Unauthorized use prohibited. All rights reserved. Are you sure you want to decline the Featured Selections? Buy Member Credits during the first 10 days of the month for only $14.99 each and redeem them for any book on the site. Buy one of our three Featured Selections and select any second book for $9.99 and a third for only $8.99. All pre-orders are available at the membership price or one Member Credit, and because they are shipped separately, pre-orders are not eligible for Feature Selection Bundle prices.